Get the best relationship advice available on the web and buy the book that will show exactly where you are in your relationship. The Map to Happily Ever After Starts Where You Are! "If you want your relationship to work, read this book. Relationship Rights (and wrongs) gives both partners understandable guidelines and the language on how to share feelings in a positive way to make the relationship the best it can be." "It is the most user- friendly resource that I have ever seen for relationships. It cuts to the core and clarifies many of the issues with which couples struggle." "A great and refreshing book based on the needs and input of people in relationships. A must-read for professionals and partners alike." Dr. Richard I. Holloway, Ph.D.
"This easy-to-read book is like a "marriage mirror" that even comes with counsel for what you can do about what you see. A nice blend of sensitivity and directness. Serving over 5 million individuals annually." "Beth has given us some simple but effective tools to evaluate our relationships. The ultimate goal of having a healthy relationship is more attainable to those willing to use these tools." "A tremendous and highly practical resource for partners and professionals alike, because it describes both the positive qualities that create a healthy relationship and the negative qualities to avoid." 1. What kind of a relationship do you deserve? 3. How do you get the relationship you want? Get a list of the Top 10 Tips for great relationships when you give us your name and email address below! Give yourself a Relationship Reality Check! 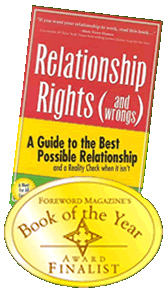 Relationship Rights (and wrongs) is the perfect relationship advice book for you if you are searching for the answers to the questions above. This book will give you the best relationship advice you can find anywhere. Are you giving up who you are or turning yourself into a pretzel to please someone? Have you become someone you don’t recognize in order to keep your partner happy? Did you and your partner fall in love with the people you are or were there misrepresentations to make the “catch”? Is your relationship mutually beneficial to both partners? Do you feel that you are doing all the giving? Are both partners yielding to each other’s needs and interests or does one partner always expect to get his/her own way (or else you’ll pay for it)? Do you want to know if you are expecting (or tolerating) too much in your relationship? Would it be helpful just to see a simple list of the behaviors found in most healthy relationships so that you could see what you have or is missing in your own? Would it be helpful to show this list to your partner (or counselor) in order to express or validate your rightful relationship expectations? Relationship Rights (and wrongs) is a MUST-HAVE for every relationship! It's a roadmap to healthy relationships. It's a must have because it has an easy to follow list of the common elements you will find in most healthy relationships. Wouldn't you like to get relationship advice from couples who are already there -- in healthy relationships? Wouldn't you like to see a list of the things in common they do (or don't do) to make their relationships work? Wouldn't you like to see what your relationship has in common with theirs? Or is missing from yours? The best relationship advice is to see what others do in healthy relationships! The list of the common elements in most healthy relationships help you see what you have or don’t have in your own. Relationship Rights (and wrongs) gives you this list, definitions and explanations in an easy to recognize, concise format to use now and to keep forever in your library for whenever you need it. For $14.95 you get an incredible value. How much would you pay to have a great relationship that makes you feel good about yourself? How would you value being in a relationship that encourages you to become the best you can be, because it is also best for the relationship? How much would you pay to have your differences with your partner settled based on agreements rather than conflict? How much would you have to spend with marriage counselors at costs of over $100/hour to discuss your differences and try to find agreements? How much time do you have to research and compile the list on your own? What price do you put on happiness and a great relationship for both partners? This is a resource to use and keep forever. This is probably less than one make-up dinner for two. This is a fraction of the price of one counseling session. This is thousands of dollars less than a divorce. This is days, weeks, months or years less than suffering in a bad relationship. THIS IS A RELATIONSHIP & MARRIAGE SAVER FOR COUPLES. THIS IS A LIFE SAVER FOR INDIVIDUALS WHEN YOU NEED TO RECOGNIZE A BAD, CONTROLLING OR EMOTIONALLY ABUSIVE RELATIONSHIP. "Relationship Rights (and wrongs) is a tremendous and highly practical resource for partners and professionals alike, because it describes both the positive qualities that create a healthy relationship and the negative qualities to avoid." Relationship Rights (and wrongs) starts with a simple agreement for couples to build on. Then all behaviors in your relationship can be measured according to the starting agreement rather than prior expectations or differences. This is the only book or relationship program that gives you a starting agreement. Why is this important? It's important because it gives you a reference point to understand and express your differences. You'll find this agreement on page 15 of the book. The Relationship Scale is an invaluable tool that will truly show you where you stand in your relationship. It is a scale from 0 to +10 to show where you feel enhanced by being in the relationship and from 0 to -10 where it detracts from you. It gives you the definitions and language to help communicate this to your partner. It gives you an independent voice to solve relationship problems based on relationship advice from relationships. It gives you the relationship advice list to make you and your relationship the best it can be. 4.) Plus So Much More! Respects and listens to your feelings and opinions. Accepts when you change your mind. Speaks to you in the same manner and tone that he or she expects from you. Respects your friends and your right to have friendships outside your relationship. Makes sure that you feel safe when you are together. Is willing to compromise in order to resolve a conflict. Accepts “no” as an answer when you don’t want to do something. Respects your right to privacy and your possessions. Doesn’t expect you to be perfect and accepts your mistakes without judgment or punishment. See what this Relationship Advice guide can do for you! Why Do You Need a List of Your Relationship Rights? If you don’t know what you should have, how will you know what you are missing? If you don’t know what is right, how will you know when something is wrong? If you don’t know where you are, how can you get directions to go somewhere else? “This easy to read book is like a 'marriage mirror' that even comes with counsel for what you can do about what you see." Imagine going to a doctor when you are not feeling well. You feel achy all over by you can't explain what's wrong. He takes your temperature and it is 103, but he has no baseline to know if this temperature is normal or not. We’re here to tell you that you are not crazy. You are not imagining things. The best relationship advice is knowing the elements in common in most relationships. Why is Relationship Rights (and wrongs) different than all other relationship books? Most relationship books start with differences. Give you a list of 20 to 500 questions to determine compatibility, before it even talks about healthy behavior. None of them give you a list of the personal rights of an individual in a relationship that make you the best you can be as a result of being in the relationship so that both partners can make the relationship mutually great. Give you a relationship traffic light to help you know when to GO-YIELD-STOP. Give you a relationship scale to help you recognize where you are in your relationship compared to most healthy ones. Give you definitions of your relationship rights. Identify feelings you may have with each Relationship Right. Give you examples of other couples understanding their Relationship Rights. Give you journaling questions to help get your concerns in writing, once you know your Relationship Rights. Relationship Rights (and wrongs) can save you not only thousands of dollars, but it can SAVE YOUR RELATIONSHIP! Thank you for visiting RelationshipRights.com. We hope that you find the relationship advice that you are looking for, and that it helps you more than any other relationship advice guide that you have used. We know once you buy Relationship Rights (and wrongs), you will find fulfillment and satisfaction in a healthy, mutually supportive relationship. Copyright 2017 Beth Sampson-Bauer and Melinda Wyant Jansen, M.S. All Rights Reserved.